what Valentine’s Day means to a florist! People might think Valentine’s Day means piles of money for florists, but would you like to know the reality? Valentine’s Day is a day of turmoil, a day of rushing around trying to please you, the customer. It means we have to frantically look for extra staff and drivers, and pray that none of them gets sick or has car trouble. We must pre-order large quantities of flowers, plants, and chocolates, which is a major gamble for us because the weather on this "Magical Day" is always uncertain. If we have arctic temperatures, we have to double or even triple wrap orders to avoid frozen flowers. And if there is a major snowstorm, our beautiful flowers and gifts will not get delivered at all. Yet, we do our utmost to satisfy all the Romeos and Juliettes of Montreal. If we can make lovers happy and bring romance and passion to you, then we have achieved our mission, and we can now look after our own Valentines. Now dear customer, please give us a break. Place your order at least a week in advance. 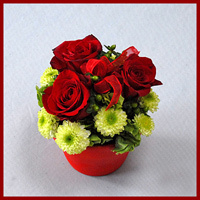 It helps us florists to plan accordingly and to ensure timely delivery. Intersting comments. No idea what Valentine means for a florist. Quite a story. Lachez-pas. Keep it up. Good luck. What will we do without you guys... THanks! i Love your Article & This Guys..
Nice story. I share your sentiment. Good luck. gogusestetigi And so good page love ity.